February is traditionally the month of celebrating LOVE with our special sweetheart. 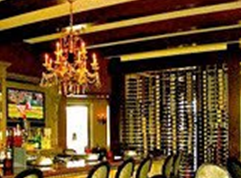 For a special dinner experience, we recommend you get a reservation (not required, but suggested) at Simply Fondue at one of their two locations (off Los Alisos in Mission Viejo, or across the street from the historic Mission in San Juan Capistrano). 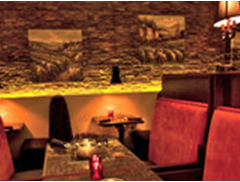 Both locations have a dark, sultry and romantic feel and a European food experience that is unforgettable. Nic, the wonderful general manager at the Mission Viejo restaurant, warmly greeted us on a busy Sunday evening. With a booked evening as it was, we couldn’t really tell because of the great service he provided and the great way the booths are designed – tall sides, so you’re not distracted by all the other guests around you. Another unique feature is the small stove in the middle of your table for the fondue experience. On this stovetop, two pots of fondue can be heated. Fondue, by the way, by original definition is “a saucelike dish of Swiss origin made with melted cheese and seasonings together with dry white wine, usually flavored with kirsch: served as a hot dip for pieces of bread.” As a kid I always wondered why I didn’t care for my parents’ fondue and now I know why – those are mature flavors for a kid! Well, welcome to 2011! 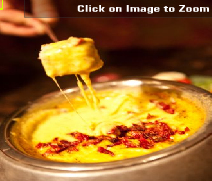 Simply Fondue has taken traditional fondue to new flavor levels (even kids like Simply Fondue)! After ordering a couple designer martinis, we started off with four traditional salads: The Greek, Classic Caesar, Spinach & Strawberry and Gorgonzola Field Greens. All were full of fresh flavors and homemade dressings. Next, Nic educated us on cheese fondues. 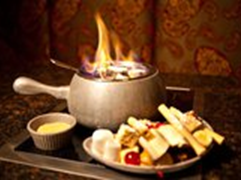 Each fondue is served with an assortment of fresh bread, crisp vegetables and fruits. We experienced two. First The Mediterranean which, in a fondue pot, melted together sharp cheddar cheese, beer, basil pesto, garlic and sun-dried tomatoes. Secondly, we had The Italian Fontina, which, combined a rich blend of Fontina d’Aosta, grated Romano cheeses, tomato sauce, white wine and vegetable broth. Both were very enjoyable. 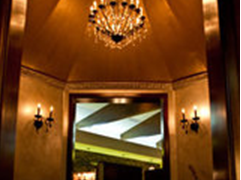 Next, Nic suggested we order the Fondue Feast – a four-course sampling of their finest fondues and meats ($49/pp). On the table he began heating up a pot for a vegetable boil and a skillet to cook the meat. A platter of assorted meats and vegetables were brought to us and the interactive cooking began. The four of us divided up the meat and had our assignments. Together we cooked, with garlic butter and oil: beef tenderloin, sea scallops, salmon, pecan-crested mahi-mahi, coconut shrimp, bacon-wrapped tenderloin, seasoned chicken, ahi sesame tuna, Jamaican jerk chicken, herb-crusted pork tenderloin, roasted garlic chicken, and teriyaki sirloin salmon! They served at least six tantalizing sauces for dipping as well. The aroma coming from our table was drop-dead heavenly and the taste was extraordinary. After wiping our mouths, rubbing our bellies, and clearing our table, Nic brought, for dessert, chocolate fondue ingredients and a tray of pound cake pieces, triple chunk brownies, marshmellows, rice crispy squares, rolled cookies, peanut butter balls, pineapple, strawberries, bananas, maraschino cherries and sugar bites. Fire up the pots! Yet, another fondue experience! Ready for this?! 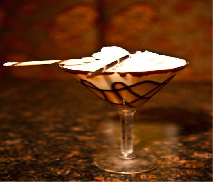 Reeses Peanut-Butter Fondue – Reeses Peanut-Butter added to their already famous milk chocolate as well as Kahlua Heath Krunch – creamy milk chocolate, swirled together with Kahlua liqueur and topped off with crunchy Heath Bar toffee bits. Other dessert options are (and you can let your imagination flow with these titles): Raspberry Cabernet, Snicker Fondoodle, Thin Mint, Chocolate Grand Marnier, Chocolate Bliss (dark chocolate), Chocolate Confusion (white & milk chocolate swirled together), The Grand White (silky white chocolate swirled with Grand Marnier), Rocky Road, Pecan Caramel Swirl, and Campfire Chocolate, just to name a few! I can see why they received the Best Dessert award in 2010! Two and half hours later, we were done. Cooked. Stick a fork in us. Our four course meal left us overly satisfied. We all slept well that night and feared the scale in the morning. All in all, Simply Fondue was a very unique, romantic, intimate dining experience that was simply pleasurable. If you’ve eaten at any of the places we’ve reviewed or have a place you’d like to recommend, please let us know on our blog: dinendesign.wordpress.com. We’d love to hear from you! Italian Orzo Pasta Salad – a Favorite!